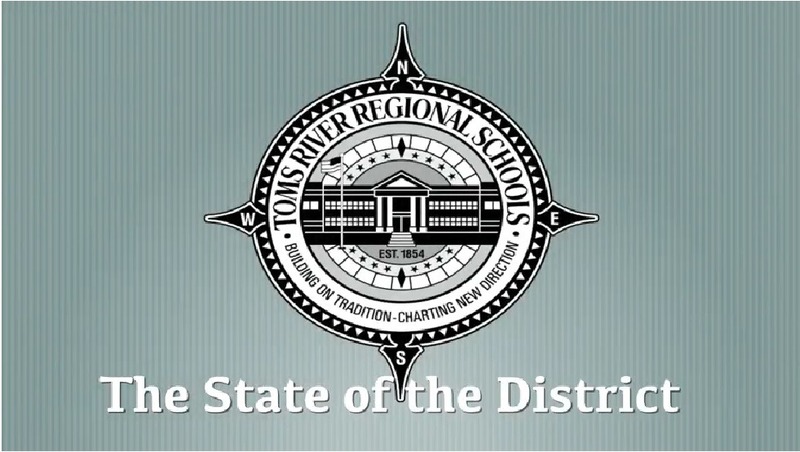 Sept. 13, 2018-- Toms River Regional Schools has publicly released its “State of the District” video address which was recorded by Superintendent David Healy and Business Administrator William Doering with the help of Toms River Schools TV (TRSTV). The video was aired for staff during a Sept. 4 professional development day, and its widespread release is intended to engage and inform all district and community stakeholders. It touches on many of TRRS’s outstanding accomplishments over the past several years, but also highlights in detail the financial windfall TRRS currently faces as a result of recent and drastic budget decreases. Its message is relevant and urgent, but also hopeful. School board and district leaders strongly encourage everyone to pay close attention to the matters discussed, which are serious and have long-lasting implications for our students, staff, and this community. You can do so by clicking “Learn More” to the right. Click below to view the "State of the District" 2018 video address.